Recommended: Auralog TeLL me More Language Software, a superb and effective system for learning a foreign language. Proven method and highly praised system. There are very few books available to teach the Armenian language to adults. This book's main strength lies in the fact that if you manage to complete it, you will acquire a substantial Armenian vocabulary. The downsides of the book, however, are a much too glib chapter on the challenging Armenian alphabet, too few reading exercises (almost none, really), and a grammatical/structural organization that is rather a baffling way to organize such a book. 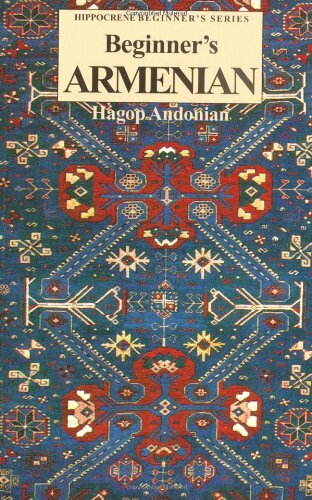 A more "inductive" language book on Armenian needs to be written, but until then this is a good, not great, introduction to this fascinating language. This is the Hippocrene edition of the book that was originally published in 1966 by the Armenian General Benevolent Union. Armenians call themselves Hai, and their language Hayeren. It used to be thought a language isolate like Ainu on the island of Hokkaido in Japan or Burushaski, a substratal language spoken by about 50,000 people in the mountain valleys of Pakistan, but it's now known to be a member of the large Indo-European family. It has a unique alphabet of 38 letters, which only have one sound, making it very phonetic. This makes for a good beginning grammar book and will help you acquire your first working vocabulary of Armenian, as it contains about 1500 words, and many useful phrases and expressions, but I suspect the average person might find the book a little too difficult as a beginning course. That having been said, I enjoyed this little book, and there are few resources out there for someone interested in actually learning the language. My interest is in comparative and structural linguistics, so the greater focus on the grammar was just fine for me. I can recommend Modern Western Armenian, by Thomas Samuelian, in two volumes, for those looking for a more complete beginner's course. I did learn a lot from this book about the grammar. There is no gender in Armenian, which is a godsend for an Indo-European language. Nouns have six cases similar to those that exist in and are well-known from Russian and Latin, and the older, root language has some archaic ones that aren't used much anymore, but the author does discuss those in some detail. Verbs have indicative, imperative, and subjunctive moods, and present, imperfect (continuous past), past (habitual past), conditional, and future tenses. The negative of a verb is formed by placing a single letter at the beginning of the verb, and there is no special form for the interrogative in Armenian, being denoted only by a change in the voice. This is different from English, which requires an auxiliary verb, or in French, which uses inverted sentence structure. Armenian has causative verbs and a compound past tense, using the auxiliary verb "have" to form it, as in "I have read," exactly the same as in English. There mostly postpositions in Armenian and only a few prepositions as we know them in English. When they do occur prepositions often govern certain noun cases and declensions. For example, the "words," "as," "until," and without and require the use of the dative and accusative case, and the word "except" governs the ablative case. Adverbs and adjectives are used much as they are in English, with the exception that adjectives, like nouns, are declined. And some adjectives, as with prepostions, require certain cases, such as the instrumental and dative. The author illustrates and lists several of these in the same section as the prepositions. The book is 208 pages long is divided up into 15 chapters, in the large trade paperback size. It contains a dictionary of 1500 words, many useful phrases and idioms, an alphabet and pronunciation guide, many paragraphs of conversation for translation, and a good capsule grammar. I found this to be an excellent book to get a good grasp of the comparative aspects of Armenian morphology and grammar, and the price is also reasonable considering there are few other resources out there on Armenian. For me the book was fine, although as I said, if you're interested in a better beginner's course you might check out the Samuelian books. Finally, both the Pimsleur and Penton's language series have audio-based courses in Western Armenian that have been favorably reviewed here too. On the title and description of this book unfortunately you can't see whether this is a Western or Eastern Armenian. Please be aware, this book is a Western Armenian. This was overall a pretty good introduction to the Armenian language, with good examples that were explained fairly well. The biggest drawback is a lack of a phonetic transliteration of the examples - in other words one must be very familiar with the alphabet before really getting into the meat of the book. Otherwise, it is well written.